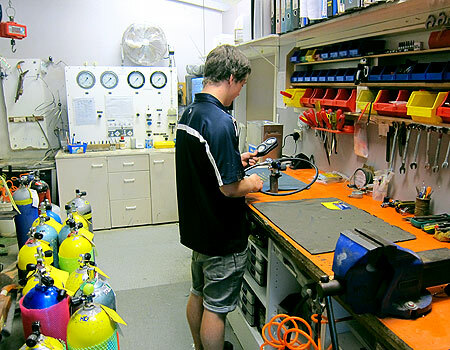 Regular servicing of your Air Delivery & Buoyancy Systems by a qualified professional is essential. We have many years experience and are qualified to service most common models of equipment on site. Most manufacturers recommend annual servicing which involves a strip, clean and rebuild to ensure safe and reliable performance from your equipment. Servicing can take a few days (especially in the lead up to summer holidays) so drop your equipment off early to ensure it will be ready on time. As with all servicing the cost varies depending on what parts are required. For a regulator service we charge $75 plus GST for labour plus the cost of parts. For a BCD service we charge $20 for labour plus parts where necessary. Our staff can provide estimates prior to the repair starting. It is a legal requirement to have your Scuba Cylinder either hydrostatically pressure tested or visually inspected every year. To check if it is in date find the most recent date stamped on the top of the cylinder. If the date is more than 12 months old, check if there is a plastic tag with a date around the valve. If there is no plastic tag, then a visual inspection is needed. This costs $38 including a fill. If the date is more than 24 months old then the cylinder needs a hydrostatic test. This costs $50 including a fill. It is a good idea to make a note of the date in the diary as it is illegal for filling stations to fill an out of date cylinder (which can be very inconvenient sometimes). Cylinders are filled at our premises in Silverdale and can be filled while you wait. We have large banks of Air and Nitrox32 to efficiently fill your scuba cylinders in minutes. Kiwi Divers offers nitrox fills up to EAN40 with our Membrane filling system. No special equipment is required - because we are putting less than 40% oxygen directly into your cylinders they are not required to be oxygen cleaned. Therefore, your cylinders only need a simple inspection and some new stickers and they are ready to go. Also, your regulator, BCD and other diving equipment do not need to be specially cleaned or altered either. Super Clean Air - Air is drawn into the system by an industrial rotary srew compressor with a 3 stage pre filter and intergrated refrigerant dryer. The membrane itself is a new technology medical membrane designed to produce oxygen and all other gases and contaminents, including most of the nitrogen, are filtered off. The De-Nitrogenated Air is then passed through a high pressure compressor with more filters. The resulting nitrox is filtered 7 times in total and exceeds "Grade E" air quality. Accurate and Consistant Nitrox - Our large low pressure compressor provides a very constant flow through the membrane allowing for extremely accurate nitrox fills. Nitrox fills while you wait - We have coupled the membrane up to large storage banks allowing for fast EAN32 fills while you wait. All you need is a nitrox certification to start using nitrox today: See our Enriched Air Nitrox Course for more information. Kiwi Divers has a digital gas filling panel supplied with Oxygen, Helium, EANx and Air. All gases can be boosted through our haskel booster pump. We ensure you receive the correct mixed gases by providing state of the art ANALOX gas analysers to check your fills. Our trimix analyser displays Oxygen, Helium and remaining nitrogen content. See our Trimix and Rebreather courses for more information.